8fit gets you in shape by helping you work out from home. Launched in 2014, the fitness app offers personalized workout and nutrition plans to help people stay active. Unlike other fitness apps, 8fit uses step-by-step instructions to explain how users can achieve their fitness goals. 8fit worked with Outbrain, the leading content discovery platform, to promote interesting articles about health and fitness across its network of premium publishers. The campaign’s objective was to engage mobile users through 8fit’s content and ultimately drive app downloads — and most importantly sign-ups for subscription. Through engaging health and fitness content, 8fit was able to attract potential users to its online magazine — and ultimately to the app. Specific call-to-actions were placed across the content to motivate users to install the fitness app and sign-up for a subscription. 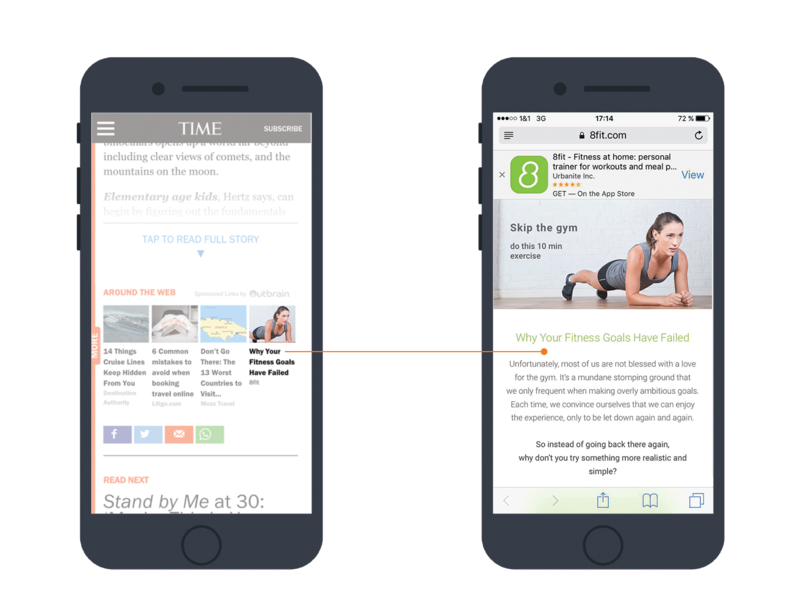 Outbrain distributed8fit’s content in the United States, specifically to mobile users, and the campaign was optimized with the objective of converting app installations into subscriptions. The distribution of health and fitness content across Outbrain’s premium publisher network enabled 8fit to reach a new audience and to significantly increase its app downloads and subsequent registrations. Within a period of four months, starting in October 2015, the fitness app was downloaded several hundred thousand times. A large part of that growth was a result of the Outbrain campaign, where the acquired conversions were well above average. Our partnership with Outbrain exceeded our expectations by far. We were able to distribute our content in a scalable manner and achieve superior results compared to other marketing channels. With the help of Outbrain’s recommendation technology, our mobile user base grew by up to 80% as they got inspired by the content and downloaded our app or subscribed to our service.